wan life to live: is it really wrong? the milk makes it okay, right? right?? more hawaii recaps later, i promise. it's too damn hot in my house to hang out right now, and i have a shitload of errands to run. Not only is it not wrong, it's wonderfully right! I don't see the problem you have milk, eggs, flour - it's basically cereal! i'm confused. what is so wrong about cake first thing in the morning? I applaud you for even eating breakfast...most people don't. and you want to feel hot? come over here, my friend. your house will feel like an igloo. girl who eats ice cream and cheesecake for breakfast sometimes. yes, AND. Who cares about right, the milk makes it delicious! What is that in the container? It is unrecognizable. I look at it as a funny-shaped muffin, so you're all good in my book! I don't see anything wrong with that picture. Mmmm... triangular muffin... Yay for calcium! 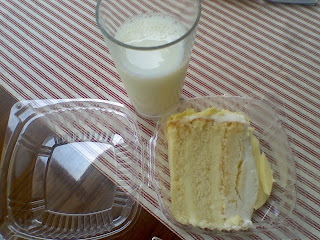 I've always been one to have cake for breakfast...so OF COURSE I think the milk makes it OK! !